When you think of tigers, do you think of them as jungle animals? Some tigers live in hot, steamy jungles in Asia, but others live in Russia where there is snow! In fact, tigers love to roll and play in the snow. In hot climates, they swim in rivers to cool off. Each tiger has its own unique set of stripes, sort of like our fingerprints – a special characteristic all about tigers. No matter where they live, tigers are pretty cool big cats. They are the biggest of the big cats and most males weigh at least 400 pounds or more. Even the smallest tigers are as long as your lunch room table! Tigers stalk their prey by sneaking quietly through the grass or trees and then pouncing. Their orange and black markings make them hard to see. They are camouflaged. Some tigers are white and have black stripes, pink noses and icy blue eyes. They are called white tigers, but also known as Royal Bengal tigers, Indian tigers or White Siberian Tigers. Some people think they are albino tigers, but they have black stripes and pigmentation (they still produce the Eumelanim pigment) so technically they are not albinos, even if they look like they are. Some White Tigers which have been in-bred suffer genetic problems and disorders that might cause them to lose their stripes almost completely and look nearly all white. They might be called stripeless tigers, but the stripes are actually opaque and can be seen at certain angles. True Albinos in nature have no color in hair, skin or eyes . The white tigers that are in-bred in zoos, or in other captivity, are also sadly prone to genetic defects, such as cross-eyes, spinal problems, distorted legs, twisted necks, internal organ dysfunctions etc. All white tigers have pink noses and icy-blue eyes. Some mistakenly consider them as albino tigers. Each tiger has its own unique set of stripes, sort of like our fingerprints. 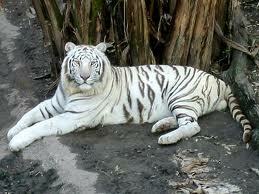 The white tigers originated from India. White tigers tend to be larger than the other tigers which are tan-orange with black stripes. All tigers have blue eyes. The white tigers have pink noses. Tiger moms have between 2 and 7 babies. 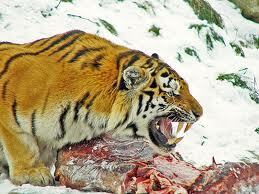 Tigers are carnivorous. They eat wild pigs, deer, baby elephants and rhinos. 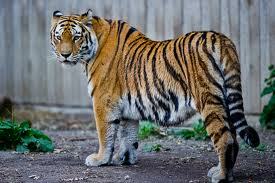 Tigers can eat 88 pounds of meat in one meal. Albino: Congenital disorder where skin, hair and eyes lack pigmentation due to absence of Tyrosynase enzyme. A video of swimming and playful tigers in the zoo with brief explanations of their behavior in the wild. Question 1: How much do Tigers eat? Answer 1: Tigers can eat 88 pounds of meat in one meal. They hunt once or twice per week and cover any leftovers with dirt. They come back later to snack on the meat again. Question 2: Are Tigers endangered? Answer 2: Yes, in fact three types of Tigers are already extinct. People hunt tigers for their fur and to make medicine from their bodies. Question 3: What countries do Tigers live in? Answer 3: Tigers live in Russia, Korea, Southeast Asia, China. Question 4: What do Tigers eat? Answer 4: Tigers hunt mainly large prey such as Deer, Buffalo, Antelopes. They will also snack on smaller prey such as birds and even eat fish. They will attack and eat other cats like Leopards. In a nutshell Tigers will eat anything they think they can overpower including humans. Question 5: How long do Tigers live on average? Answer 5: Tigers can live up to 25 or 26 years in the captivity (Zoo etc.) In the wild they can live up to 20 years, but generally in the wild an average of 10 years. Question 6: Do Tigers live in groups? Enjoyed the Easy Science for Kids Website all about Tigers info? Take the FREE & fun all about Tigers quiz and download FREE Tigers worksheet for kids. For lengthy info click here. Declan, Tobin. " Fun Tiger Facts for Kids ." Easy Science for Kids, Apr 2019. Web. 23 Apr 2019. < https://easyscienceforkids.com/all-about-tigers/ >.